It was reported in the Straits Times in June 2013 that as many as ten saltwater crocodiles are now living in the north-west coast of Singapore. They live predominantly in an area known as the ‘Sungei Buloh Wetland Reserve’. When this information was released (read the report here) it surprised a number of people. It was generally known that one or two crocodiles hung around this proximity. However the news that as many as ten were now living there was all new. Apparently the population increase is mainly through the newbies swimming across the Straits of Johor from Malaysia (which is illegal I might add so don’t try it). Stephanie my wife had almost recovered from last weeks overnight microadventure sea kayaking to the Sisters Island. The poor girl had to put up with rats stealing her chips, fast ferries roaring past, strong currents and a blisteringly hot night in the tent (read more here). I decided this week she needed something a little more relaxing. How about a bit of crocodile spotting instead? Every microadventure needs some planning and preparation. 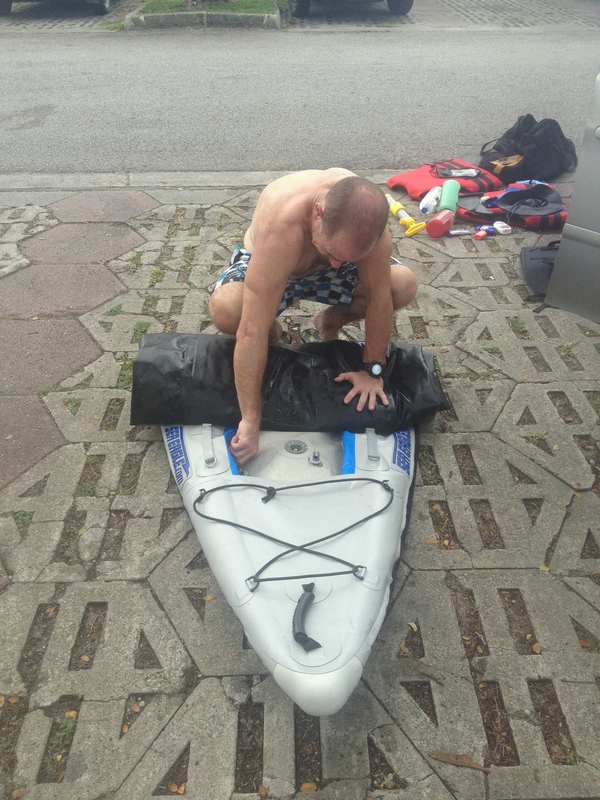 I did a small recce on my bicycle the day before to find a spot to launch the ‘Divorce Machine’ (the term given to our sleek gray Sea Eagle Fast Track inflatable kayak). I found a wonderful little car park right beside the Kranji Reservoir with a small rocky breakwater which we could clamber down to launch off. We set off on Sunday morning and were ready in the water at 9AM sharp. Instead of heading directly to Sungei Buloh to search for crocodiles, we first headed north-east to check out the main causeway between Singapore and Johor Bahru. 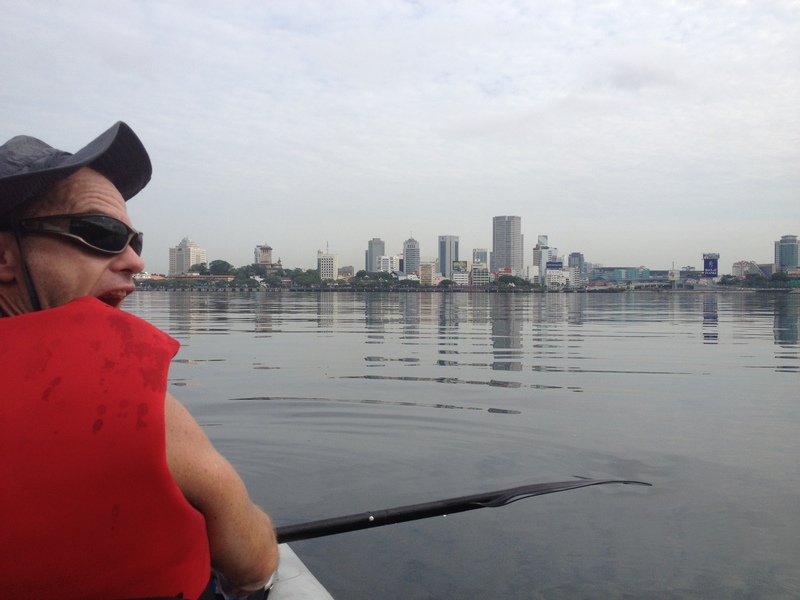 This was around 3.5km of paddling on mirror smooth water and we made great time to get there in only 30 – 40 minutes. This part of the paddle was our least favorite of the whole day. The water is really quite dirty and oily, and smelt pretty gross. Obviously border crossings between countries are sensitive spots and we turned around approximately 500m from the causeway. However not before some ever vigilant guards had called in the coastguard to check us out. Not too long later as we paddled back west, we were visited by the ‘coastguard’. They pulled us up in their blue and white patrol boat and asked for us our details (identity card numbers, names etc). While one of the staff checked our details on the radio, we had a nice chat to another officer. He was very polite and friendly and gave us some advice about our paddle. “Watch out for the crocodiles down around Sungei Buloh. They’ve been sighted last week and they are as long as your boat!” he told us. He also mentioned that they frequently find people trying to swim across from Johor to Singapore (or vice versa) along this area of the Straits. Although the number has decreased over the years. ‘Maybe due to the increase in crocodiles?’ I thought quietly to myself! After getting checked out and given the all clear by the coastguard, we waved goodbye and paddled off towards Sungei Buloh. The Sungei Buloh Wetlands have been a nature reserve since 2001. They are basically a wetland area full of mangroves, rivers, jungle and abundant animal and fish life. Whole schools of fish were jumping out of the water, 20 – 30 at a time as we paddled slowly along. 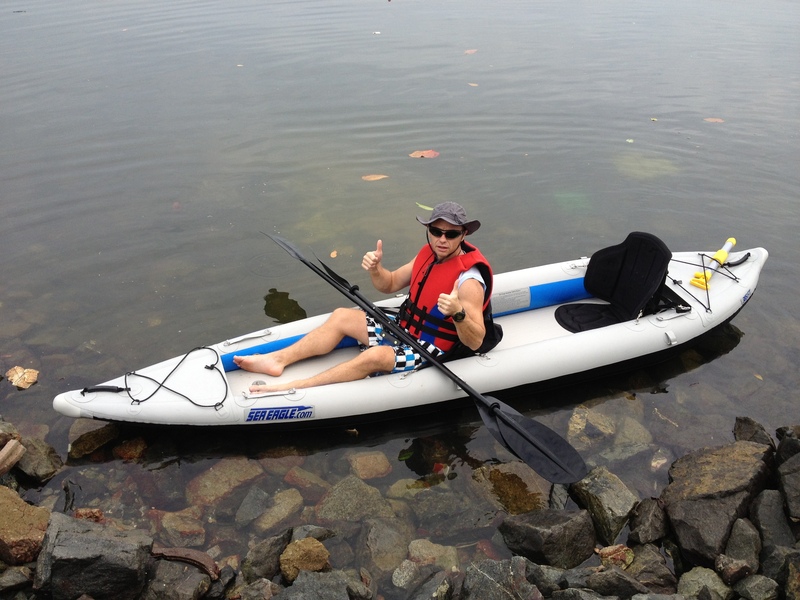 There is very little vessel traffic in this area compared to the Sembawang/Ubin and Sentosa area’s so paddling is nice and quiet. We kept a keen eye out for crocodiles floating in the water and my eyes started to play tricks for me with logs and sticks that we passed along the way. 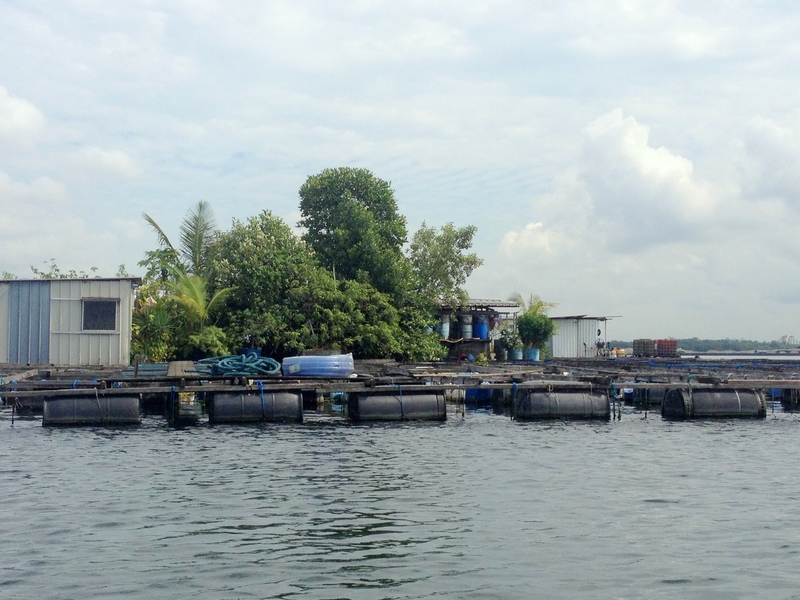 The area off Sungei Buloh and slightly to the west is full of floating fish farms (some people refer to them as ‘kelongs’). 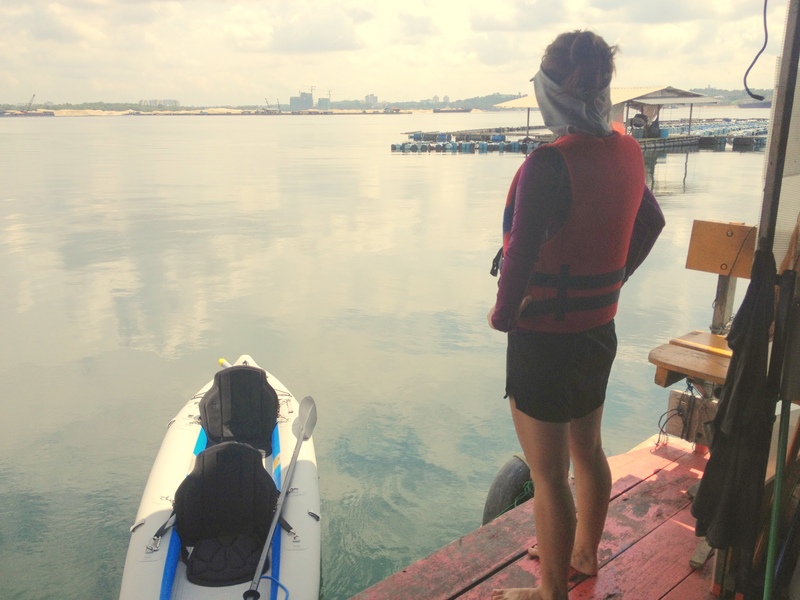 From previous experience, we knew kelongs are often guarded by one or two noisy dogs which get very excited as you paddle past. Some of the kelongs were very large, and even had their own on-board gardens. 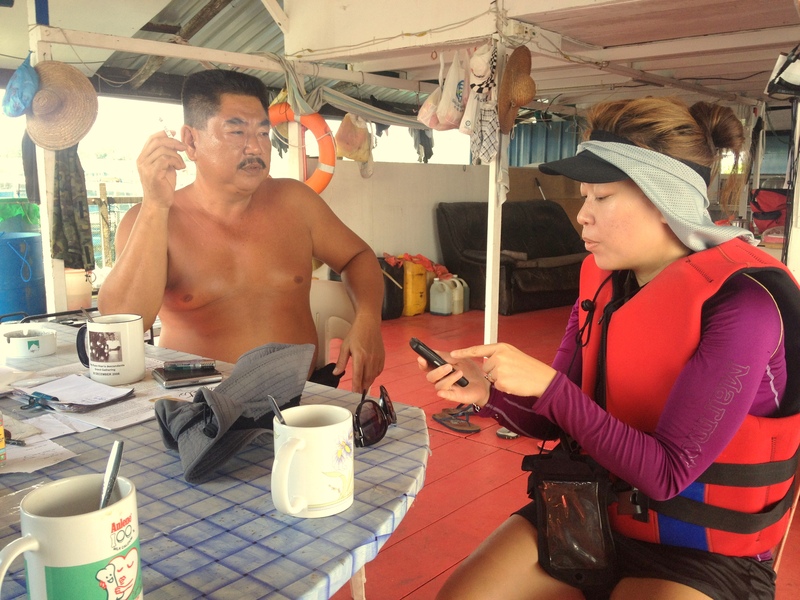 As we paddled around the back side of one large kelong, we came across two Chinese gentlemen fishing. “Hello, ni hao?” I called. “Hello, how are you?” came back a very friendly reply. After some small chit-chat it was evident they spoke as much english as I spoke mandarin, so Stephanie took over the conversation. “Ni yao her cafe ma?” (“Do you want to drink coffee?”) one of the men shouted out(his name as we found later was ‘Mr An’). We looked at each other “Yeah that would be great!”. 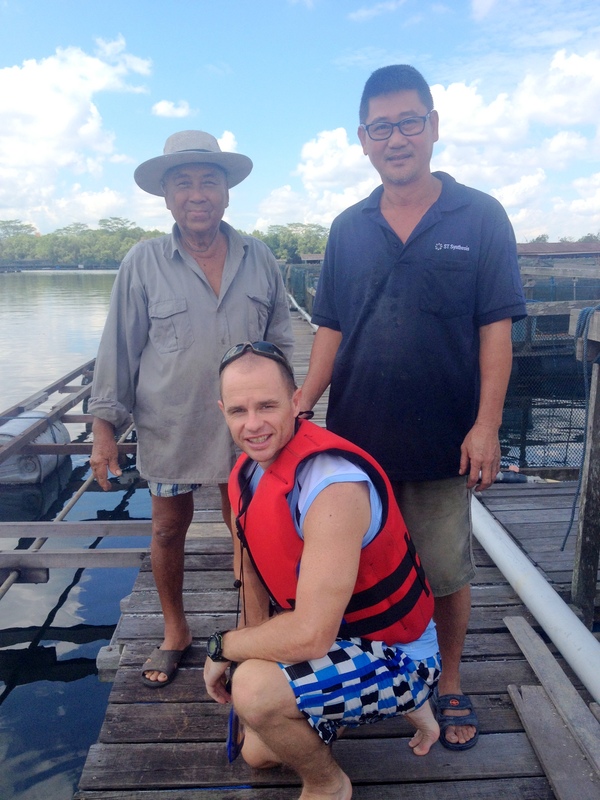 It was exciting to get invited onto a kelong as we had never had the opportunity to be on board one before. We thanked them profusely for allowing us the chance to tour their kelong and that’s when Mr An explained that this is not a kelong but a fish farm. Kelong is used to catch wild fish while fish farm is for breeding fish. Thanks to our friendly hosts, we learnt lots of new things today. They were really nice guys and as Stephanie translated our conversation, they gave us a wonderful tour of their fish farm. We sat and drank coffee inside their small shelter and the conversation soon shifted to the subject of crocodiles. “Yes we see the crocodiles very frequently” Mr An explained. “But they never come out into the channel here, they always stay close to the mangroves, closer to the shore”. After the coffee we were expecting to head off, when Mr An said “OK now you meet the boss of the farm!”. It turned out the farm is run by Mr An’s uncle. He turned out to be a smiley faced older man who was 75 years old. One look at his sun tanned, fit body you could tell this was a man who had spent a life working hard in the outdoors and was in great shape. “Angmoh!!!!! !” (a term generally used to describe a ‘white person’ in Singapore) he shouted loudly with a huge smile on his face. I got the feeling he had not seen many ‘Angmohs’ before). He shouted it out repeatedly to a couple of other men who were helping him also. We all had a chuckle and took some photographs together and before we knew it, he had invited us over to his house on the opposite side of the fish farm to meet his wife. 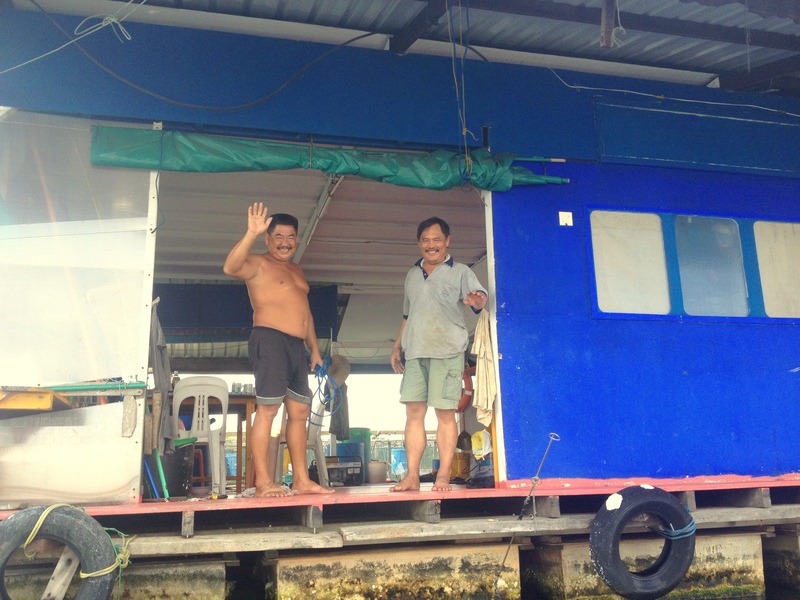 Apparently they had lived on this floating fish farm for over ten years. Before this they lived close-by in a small kampong (village) on the banks of the river for twenty years. The kampong no-longer exists. He told us he could remember the Japanese invading Singapore and seeing dog fights between the English and Japanese planes. They gave us coke to drink and even invited us for lunch. What else do you eat on a fish farm but fresh fish of course and the lunch looked superb but we turned it down as we felt a little like we were imposing. I sat beside his wife and Stephanie translated our conversation. She also looked very strong and fit for someone in her mid 70’s. “I am fit because I eat fish every day” she proudly told Stephanie. “Do you ever eat lamb?” Stephanie asked her? She shook her head and Stephanie replied “OK next time we come out we will bring you some frozen lamb from New Zealand”. She was very proud to show us her garden. Here she grew all kinds of leafy vegetables including kailan, bittergourd, spring onions, even papaya and many other things which I could not catch the english name. We probably spent on hour with them but all too soon it was time to head off. It always amazes me how the smallest, quietest places you visit have the most friendly and charming people. Mr An and his family were all so genuinely friendly that it was a humbling and special experience and meeting them was really the highlight of the day for us. They even gave us their telephone number and invited us back again in the future. So off we paddled for more crocodile spotting. Very soon we had come to the start of the Singapore Ministry of Defence live- firing area. This is off-limits for kayakers so we turned around here and started back the 7km to Kranji. This time we paddled close into the mangroves and the shoreline. There were literally fish jumping out of the water all over the place. No wonder the crocodiles are coming over here with this amount of fish to feed on. We soon became a little nervous about being too close to shore and headed further out into the channel. The sun was beating down and it was hot work to get back to the car, clocking in a total distance for the paddle of 20.25km. This was a wonderful part of Singapore to paddle in. It was a complete surprise for us at how beautiful the area around Sungei Buloh and Kranji is. We have both never visited this area before and we had a great day together. It is very refreshing to be able to come to parts of Singapore like this.. Places that still feel wild, have plant and animal life which is actually thriving and growing, and you can still find down to earth, friendly and hospitable people with that wonderful ‘kampong’ spirit. OK, we never did see any of those ten crocodiles, but………….I am pretty sure they would have seen us. Maybe another time. Enjoy the photo’s below – all taken by long suffering and lovely wife Stephanie. All set and ready to go at 9AM sharp. Heading north-east – that’s the main causeway between Singapore and Malaysia in the distance. 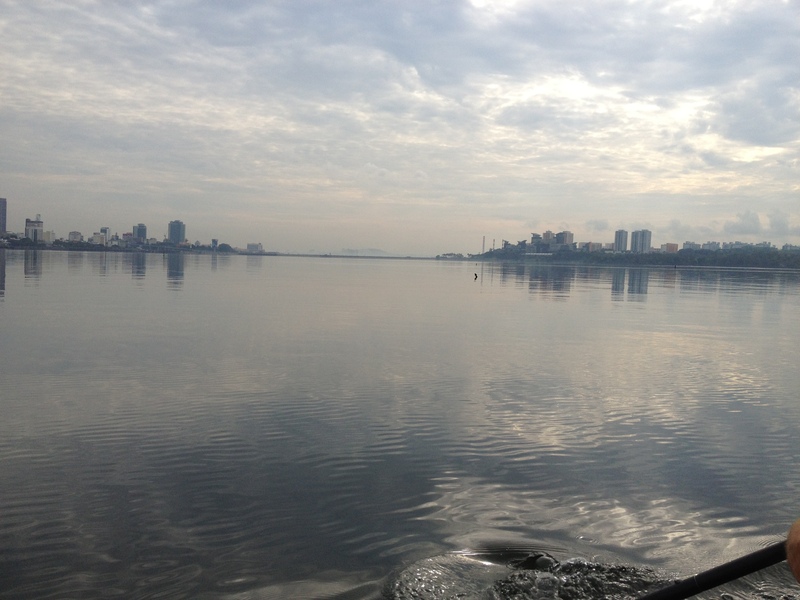 We turned back here, about 500m from the main causeway – that’s Johor Bahru City in front of me. We got ‘pulled over’ by the friendly boys in blue. 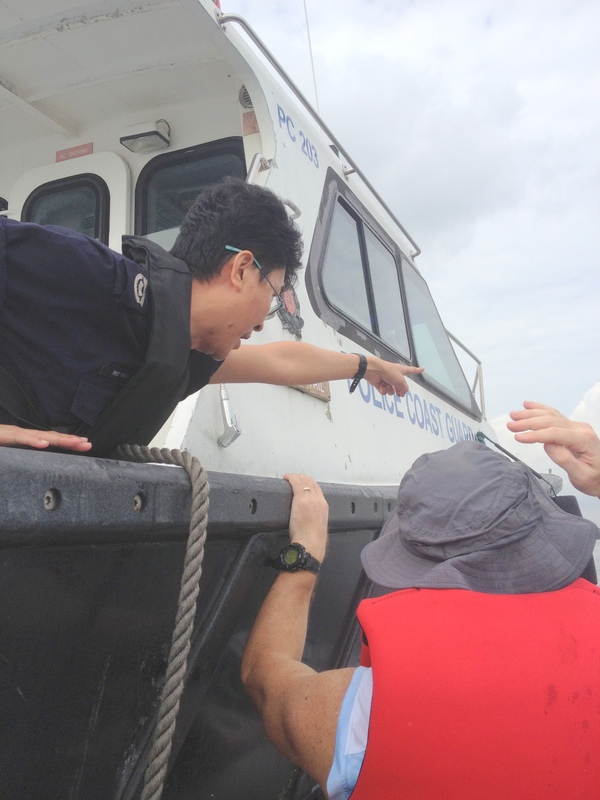 This coastguard officer was really friendly and warned us about the “crocodiles in Sungei Buloh”. These two guys came out to check us out and ‘bark’ us away. Stephanie and Mr An on a tour of his farm. With the boss’ wife in her garden. More of her beautiful green garden. 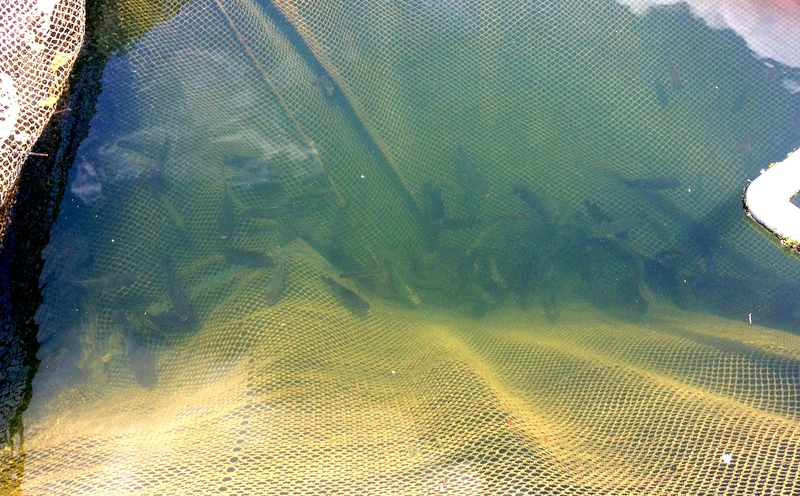 Some of the smaller fish in the nets. SUP fishing??!! This guy was standing up and balancing on a big sheet of polystyrene as he fished with a net – impressive! 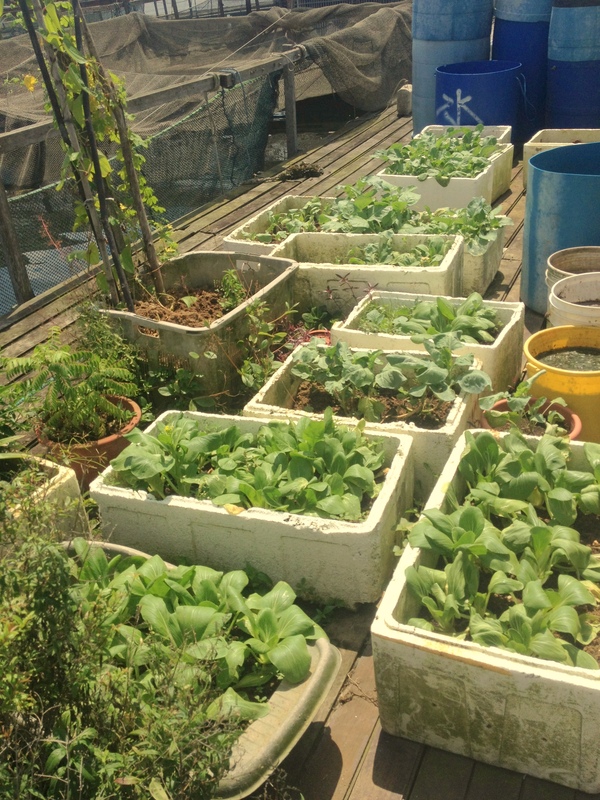 A fish farm with a lavish green floating garden. 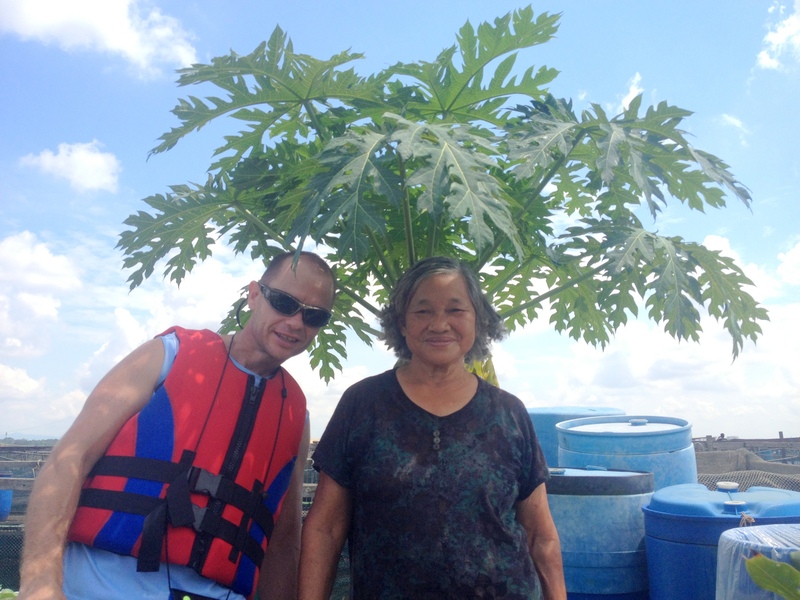 Stephanie standing on Mr An’s fish farm – that’s Danga Bay – a new condo development in Johor out in the distance. There is very little vessel traffic in this area – this was one of only two large ships we saw. 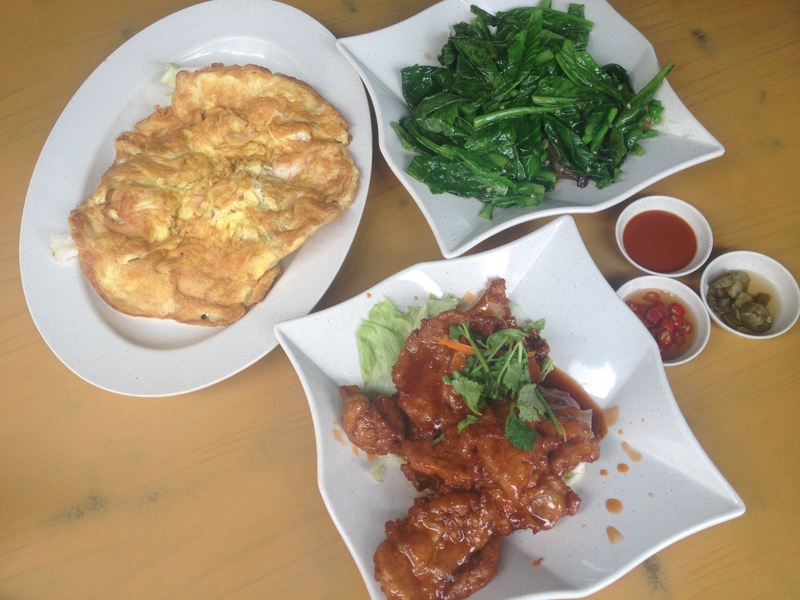 A well earned late lunch, pork, omelette and kailan. Food tastes great after 5 hours on the water! Posted on August 18, 2013, in Microadventure, Sea Kayaking, Singapore Micro Adventure and tagged crocodile singapore, crocodile sungei buloh, Inflatable sea kayak Singapore, kayak kranji, kayak singapore, kayak sungei buloh, kayaking singapore, microadventure, singapore micro adventure, stephanie ong rawlinson. Bookmark the permalink. 9 Comments. Hi Alex – you left early! See you soon on the touch field. 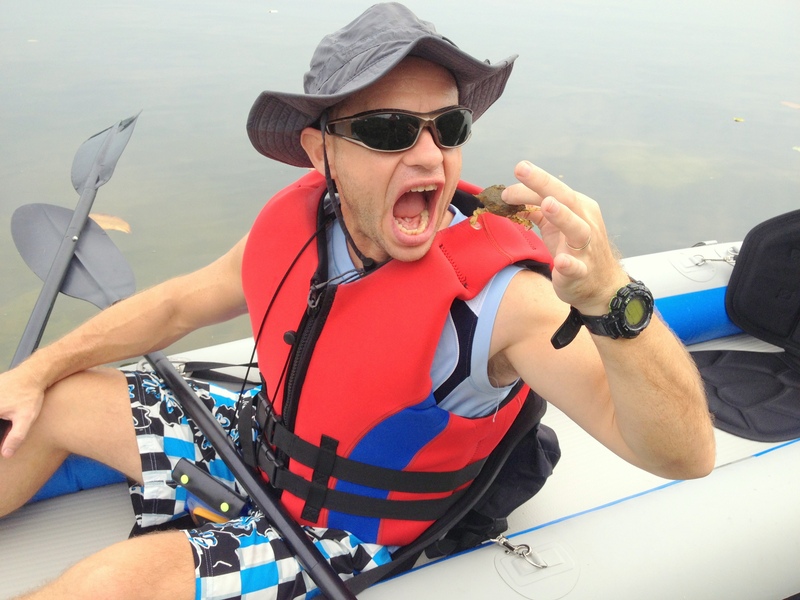 You should come paddling with me one day – bring one of your boys (or wife or girl!). Hi Kate! Yes it was a great little trip. It’s always nice exploring new places and especially finding new spots which are close to home is really cool. Thanks for dropping by! Hi Jason, thankfully the ‘Divorce Machine’ has not lived up to its name so far! Love reading about your adventures!